The Family Suites are the ideal choice of accommodation for your family vacations, should you wish to stay together with your beloved ones. Enjoy a spacious area of 80m2, with two separate bedrooms, two bathrooms (one with hydro-massage bathtub and one with walk-in shower) as well as a separate living room & dining area. 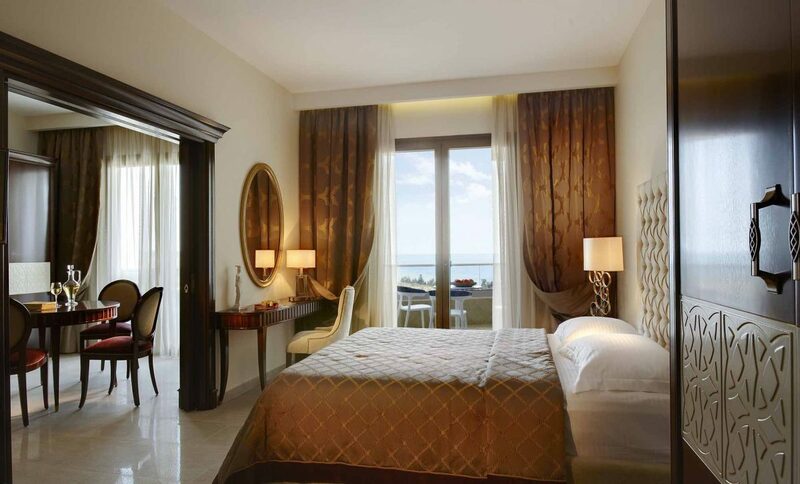 All Family Suites are located on top floors, with large balconies and offer magnificent views of the Aegean Sea, the olive groves and the landscaped gardens. Family Suites sleep a maximum of 4 adults or 3 adults and 2 children, with one single sofa bed and a couch as standard in the living room area. Children under the age of 12 years stay free in existing bedding. We would like to inform you, that all rooms & suites are smoke-free at pomegranate in our effort to ensure a refreshing stay for all our guests. Children under the age of 12 years old stay free in existing bedding. Please note that floor plans are for illustrative purposes and actual room layout may vary between individual rooms or suites.